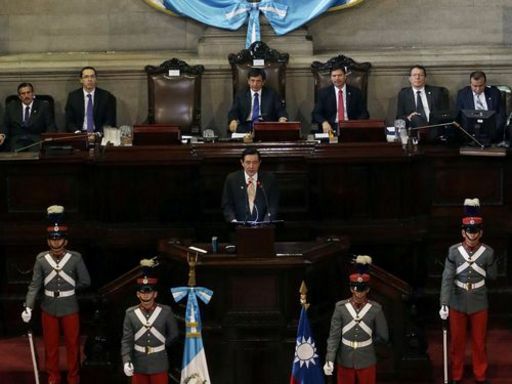 Guatemala City, March 15 (CNA) Taiwan's President Ma Ying-jeou (馬英九) spoke of his efforts in promoting regional peace during two speeches he delivered Tuesday in Guatemala, the first stop of his last overseas trip before leaving office in May. Ma was invited to give a speech at the Central American Parliament, also known as PARLACEN, and another in front of the Congress of Guatemala on the second day of his stay in Guatemala that will last until Wednesday. At PARLACEN, Ma first thanked the regional organization for its friendship with Taiwan and support for Taiwan's presence in the United Nations Framework Convention on Climate Change and the International Civil Aviation Organization Airport Codes. Taiwan has been an observer in PARLACEN since 1999. He also expressed gratitude for PARLACEN's outspoken support for Taiwan's East China Peace Initiative, before starting elaborating his government's efforts in the promotion of peace in the Taiwan Strait, the East China Sea and the South China Sea since he took office in 2008. In terms of cross-strait relations, Ma said that the Taiwan- mainland China links have been promoted on the basis of the "1992 consensus" and "one China, different interpretations" principles. So far, the two sides have signed 23 agreements, and the direct flights between Taiwan and mainland China have increased from zero to 110 per day, Ma said, noting that the number of Chinese students studying in Taiwan have also risen to 45,000 from 823 eight years ago. The improvement in cross-strait relations has generated a "peace bonus," and the president said that he is not opposed to allies' developing trade links with the mainland as long as they are not official relationships. As for the East China Sea Initiative he broached up on Aug. 5, 2012, Ma went on, he proposed the idea that "sovereignty can not be divided but natural resources can be shared," urging the countries concerned to put aside disputes and work together to explore natural resources in the East China Sea. Based on the initiative's spirit and principles, Taiwan signed a fishery agreement with Japan on April 10, 2013, achieving the goal of "no backing down on sovereignty in making big progress in fishing rights," Ma said. And with the successful experience, he put forth the South China Peace Initiative in May 2015, under which Taiwan and the Philippines signed a fisheries law enforcement agreement. Ma called the pact a concrete example of realizing the peace initiative. In his speech before the Guatemalan Congress, Ma further expressed hope that all the parties involved in territorial disputes in the South China could replace confrontation with dialogue and resolve disputes through peaceful means so that ships and planes passing over the sea can take place unhindered and protected. PARLACEN is a political institution and parliamentary body of the Central American Integration System. Its headquarters is situated in Guatemala City. It was the third visit by Ma to Guatemala, following his first such trip in 2000 as Taipei mayor and again in 2009 as president. Ma is due to travel to Belize on March 16, the second and last leg of his latest visit, before returning home via Los Angeles.